This medication belongs to angiotensin converting enzyme (ACE) inhibitors. 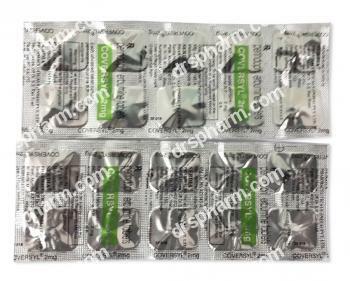 It is used to treat arterial hypertension, chronic heart failure, to prevent recurrent stroke in patients who have already had a stroke or transient ischemic attack, stable coronary heart disease for decreasing of complications in patients with stable coronary heart disease. Take inside before a meal, as a single dose daily at the same time. In case of arterial hypertension its dosage is 4mg or maybe increased to maximal daily dose of 8 mg. Do not take more of the medication than it was recommended, or take it for longer than your doctor prescribed. This drug can cause serious fetal harm (in some case even a death case) if used during the last six months of pregnancy. Avoid drinking alcohol. Do not consume salt substitutes or potassium supplements if you are concomitantly are treated with Coversyl. Hypersensitivity, angioneurotic edema in medical history, pregnancy, breast-feeding, infancy (safety and effectiveness are not determined). In case headache, dry cough, nausea, unusual weakness, back pain or diarrhea are experienced notify your doctor. Also arterial hypotension, chest pain anemia, high level of hemoglobin (at the beginning of treatment). This drug rarely but causes serious (possibly fatal) liver dysfunctions. Notify your doctor about all nonprescription and prescription medication you use, especially of: anesthetics for surgery, narcotic pain relievers, lithium, potassium supplements, potassium-sparing 'water pills', diuretics, high blood pressure medication, trimethoprim-containing medications, aspirin-like drugs. Avoid drugs that may increase your heart rate such as decongestants or caffeine. Symptoms of a Coversyl overdose may be as follows: feeling extremely dizzy or light-headed, or fainting. Contact your doctor for help. Medication should be kept at room temperature of 59-86 F (15-30 C) away from light and moisture.